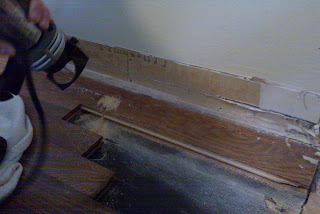 After finishing out the floor joist replacement and sheeting the floor, the temporary floor support was removed. I was alone during the stud replacement work due to dad working for Numed to do some preventative maintenance at his Atlanta accounts. I did not get a chance to snap shots of putting this together, but I started by cutting and measuring the floor pieces of 2x4 that the studs sit on. I had to put the stud replacement pieces on the floor plates in the room because it was too large to fit through the doors. After some awkward juggling with the assembly and the nail gun, I had it all together. I cut the bottom plates a little short so that the whole thing would slide into place. The following picture shows it all in place. I had to slide the exterior sheeting in before the studs were in place because the entire assembly would not have made it into place with the sheeting on. 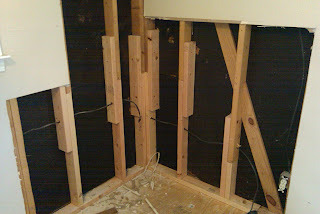 I nailed the splicing pieces on next to ensure the studs mated appropriately. I finished by drilling the holes to rerun the wiring. 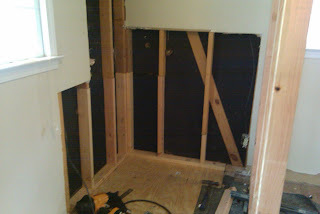 I refined the sheet rock edges to prepare for dad and Annie putting up the sheet rock on Wednesday. I also learned to remove wood flooring more efficiently. 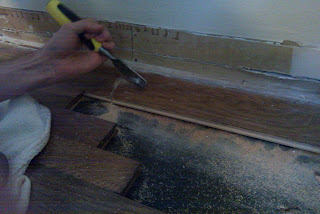 You start by drilling two holes at the end of the board and cutting two lines down the length of the board to meet the holes. You then knock the center piece out with a wood chisel. You can follow up by prying out the boards without damaging the adjacent boards.